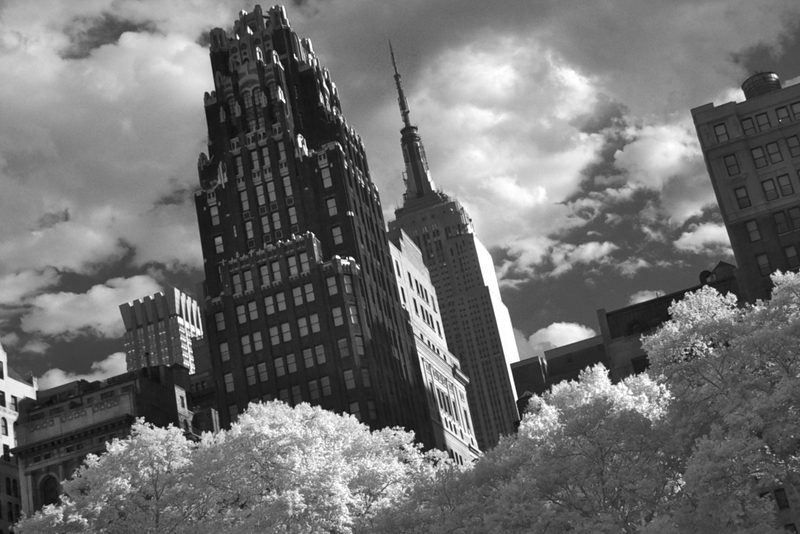 In the foreground is the American radiator Building, now the Bryant Park Hotel. It is the subject of the famous Georgia O’Keefe painting, “Radiator Building—Night, New York.” Looking over its shoulder from approximately a quarter mile is, of course, the Empire State Building. This was taken from Bryant Park, which sits behind the New York Public Library. I wasn’t planning on another infrared today, but I slept late and this was so easy to get ready for publishing. I like the angle you used here Mark, really brings the trees and clouds in nicely! Good stuff! Diggin the angle, and that the trees feel like clouds, thus it feels like a floating city. So awesome! Cool shot of a cool building. I like the angle and the infrared treatment. Cool shot, the angle works nicely and love the IR work. I love this photo, Mark, great perspective and the IR aspect really introduces quite a bit of drama! The photo is breath taking! My goodness. It’s really awesome. You’ve made a really delicate and very close to perfect right there. I wish i could make photos like that. God job! Thanks all for the comments, and especially to Minah, whose extraordinary praise is a bit overwhelming but much appreciated. Beautiful shot, makes me want to go to New York. I wonder how it looks in color. What a shot. It really takes your breath away!